Join us at our in-store Café to enjoy an evening of authentic curry using the best ingredients and meet new friends as you sit together to enjoy the supper club. 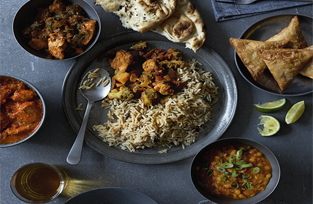 The cookery school is hosting a curry supper club in the stores's Café. Just sit back as the chefs prepare and cook dishes using authentic Indian recipes from the Cookery School. Throughout the evening, the Partners will introduce the dishes when they are served. Half a bottle of wine and soft drinks will be served to each customer. Shopping bags filled with the ingredients from each dish will be on display to purchase at the end of the evening, including the recipe to recreate the curry.